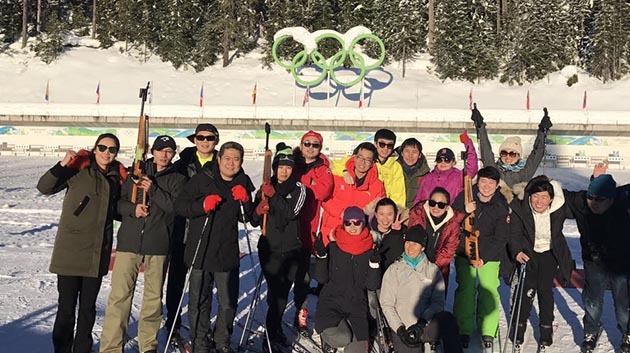 When China came knocking on BC’s door to ask who could help them plan for the 2022 Beijing Winter Olympics, UFV answered with enthusiasm. In 2010, British Columbians threw a giant party and hosted a Winter Olympics that will live on in memory for decades to come. By doing so, they created a pool of expertise about how to host an Olympic Games. Now UFV is helping the hosts of the 2022 Olympics plan their turn putting on the big show. UFV’s organizational agility, knowledge, and responsiveness helped the university land the contract. UFV International has teamed up with the Kinesiology department to host 20 delegates from the Winter Sport Centre of the General Administration of Sport in China (part of Beijing Sport University) for an intensive 13-week academy on how Canadians develop athetes, how our sporting organizations operate, and how Vancouver was able to host a successful winter Olympic games in 2010. The delegates include coaches and sports administrators from across China. Kara Bertram of International Education and Chris Bertram of Kinesiology have worked together to assemble programming and handle logistics. The curriculum has been a mix of classroom lectures delivered by UFV experts and sports administration professionals and experiential learning activities and site visits in the community. 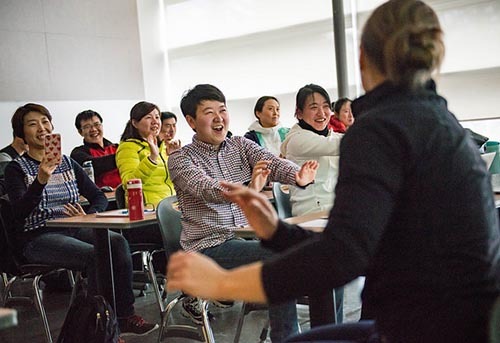 UFV professor Joanna Sheppard and the Chinese delegation participating in “desk dancing”, a way of encouraging physical activity during classroom sessions. 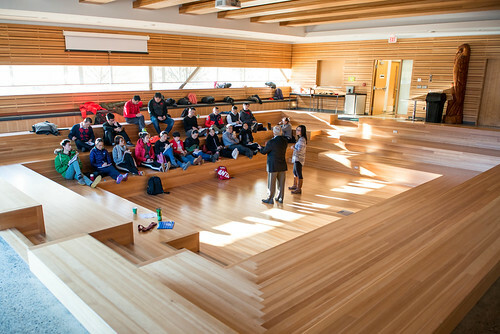 In the classroom, they’ve heard from UFV faculty members such as Roger Friesen, who has served as a sports psychologist at several Olympics; Lauren Couture on leadership and coaching; Chris Bertram on motor learning and performance enhancement; and Brian Justin on strength and conditioning. Larissa Horne, UFV’s experiential education coordinator, shared her insights from her time as a volunteer coordinator for the Vancouver 2010 Olympics. 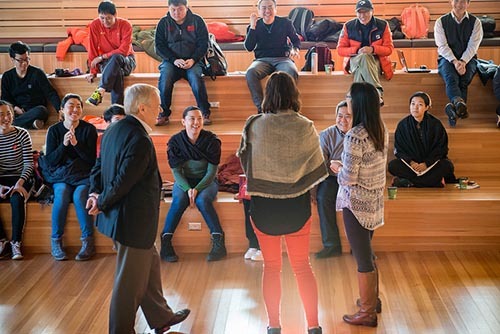 UFV has also exposed the Chinese visitors to experts from VANOC (Vancouver Olympic Committee), the Canadian Sport Institute, and Pacific Sport, as well as an Olympic skeleton athlete/coach, and sports management consultants. On the community side, they’ve attended both a Chilliwack Chiefs and a Vancouver Canucks game (getting intensive behind-the-scenes tours at both), and met with Chilliwack City Councillor and outdoor sports entrepreneur Sam Waddington. “For the group to see how the Chilliwack Chiefs are not just a sports team, but an integral part of the community and a partner to local business was a real eye opener to them,” Chris notes. In additional to the hockey experiences, the group got to visit Whistler twice, including for a World Cup event in skeleton, to the Richmond Sports Oval, to Vancouver, and to Manning Park for a lesson in snow management. Chinese delegation visiting with UFV President Mark Evered. 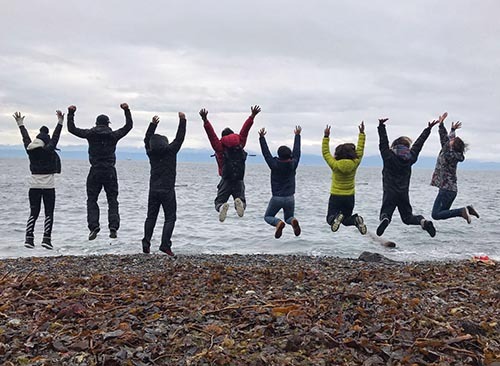 “The concept of experiential learning was perhaps new to them, but once we got them out there experiencing our Olympic venues and talking to people who were involved they really came to see the value in it and asked for more,” says Kara. And just living in home-stays with Canadian families and observing our neighbourhoods and communities was educational for them, says Chris. Leaders of the Chinese delegation praised UFV for the knowledge and professionalism of the team assembled for this program. With a memorandum of understanding and talk of future collaborative projects currently in the works, both UFV International and the Kinesiology department hope that this 13-week program is just the beginning of a more formalized relationship between UFV and sports-focused universities in China. “The success of this program has shown that UFV is well-positioned to provide high-level training and we now have a template in place for further training contracts of this nature. We are also looking at exciting opportunities for UFV students to travel to China for learning exchanges in kinesiology,” says Kara. David McGuire, head of International Education at UFV, says that this project illustrates the breadth of opportunities in the field of internationalization. The Chinese delegation is based at the UFV Chilliwack campus at Canada Education Park until they depart on Wed, Jan 25. A farewell celebration will take place on Jan 24, highlighted by a certificate ceremony with President Mark Evered and Director of UFV International David McGuire. I understand that this initiative is exciting and has potential for grow within UFV; however, I am expressing concern in regards to the blatant abuse that has been reported in China’s Olympic Training Programs, as well as the appalling human rights violations against a spiritual form of exercise, Falun Gong. It has been well documented, and verified by the US government and UN that citizens whom practice falun gong are persecuted and their organs harvested for profit. My concern is simple, why are we supporting, and looking to build future collaboration with a Olympic System, and Government that commits such atrocities. I am asking the Faculty of Health Sciences, and UFV Administration to consider a thorough evaluation of human rights in future projects that involve organizations outside of UFV. As an academic institution, we should be striving to uphold the highest level of moral integrity within our institution.